So I'm really trying to eat protein for breakfast, but it was too cold to eat yogurt and how do you make eggs at work? Then I stumbled upon some instructions for poaching eggs in the microwave, I played around with it and ended up with this. Though I draw the line at taking pictures of my food at work. Here it is modeling in my windowsill. I have really cranked down my sweet tooth, even oatmeal with dried fruit is too sweet for me. Sweet potato is just sweet enough, and I swear with the beans it tastes like mochi. First, the mash, which I happened to have on hand from a bout day breakfast. Remember the four sweet potatoes that you baked all at once? Rinse and drain a can of black or red beans and mash them. Grab one of your sweet potatoes and mash it into the mashed beans. This is also good just as a bed under some fried eggs, or fried into cakes. 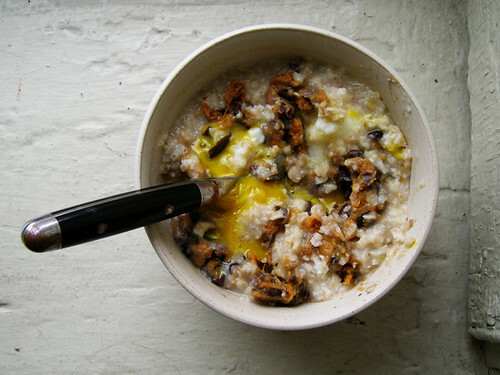 Put the oats in a microwavable bowl and stir some hot water into them, enough to make it just soupy. Crack the eggs into the bowl and microwave it on high for 1-2 minutes, it depends on your microwave and whether you started with hot water like I said. I do 90 seconds in the microwave at my work, then I let the eggs sit for another 30 seconds. Spoon some sweet potato bean mash over the oatmeal and stir it in.